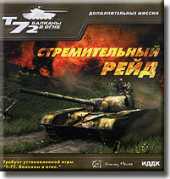 This add-on expansion released only in Russia includes full online multiplayer support (the original game release allowed for single player and LAN only) for up to eight players as well as 20 completely new maps (including 10 multiplayer). You will have to work hard, after all, the problem is much more complex, and enemies become more and they become more insidious. At least one new playable tank was added as well. The developers have taken into account fan wishes and the game atmosphere improved, jobs have become less linear, and the plot is more unpredictable.